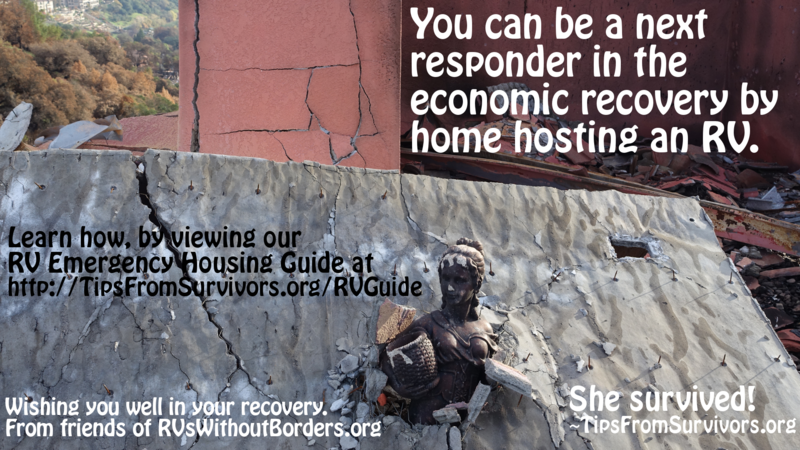 RVsWithoutBorders is an experiment in sharing/gifting economy to see if we can mitigate the economic damage to individuals and their communities by offering rapidly deployable emergency housing. We also advocate for the use of RVs in disaster response and assist local communities in understanding best practices. Our project was conceived on September 16th, 2015 in response to the Valley Fire in California that destroyed over 1,600 homes. The idea began with “instead of storing my RV for the winter, someone in need should live in it”, and “maybe other RV owners would feel the same”. Within 4 days our first house trailer was brought to the disaster area by its owner and lent to a displaced resident. In the 4 months that followed we learned many valuable lessons while serving additional clients. Following the 2017 Northern California firestorms that destroyed over 7,000 homes, the Sonoma County planning department contacted us and asked if we could assist. They indicated a willingness to adopt RVs immediately for emergency housing, so we are re-starting the donation process again. There is always a lack of FAST emergency housing in affected disaster areas. To optimize economic recovery for EVERYONE, it is essential to keep the MAXIMUM number of residents in the disaster zone because de-population affects schools, businesses and city services. Only RVs can arrive fast enough to do this. RVs can also help individuals maximize their budget for rebuilding and reduce relocation stress. In addition, RVs support our preferred grass roots model for “maintaining community in community by the community and for the community”. In short, this means we seek “home hosting” of RVs, where the owner of an intact home plugs a temporary RV into electric, water, and sewer. This is the ONLY hosting model we feel can scale, since the challenges of group encampments from managing infrastructure to health to safety rapidly doom nearly all encampment efforts. In contrast, connecting a friend’s RV in your driveway can be as easy as 5 minutes, with no health, safety, or security concerns. Compared to large non-profits, we believe the emergency housing model we offer enables donors or RVs and parking spaces to have a MUCH GREATER IMPACT on recovery by being connected to each individual that gets help. That’s a radical departure from what most emergency response organizations do. 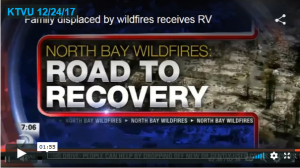 RV/vehicle donation agencies usually sell your vehicle, while large NGOs are needed in the emergency triage stage, none effectively serve transitional housing needs during recovery and FEMA usually just cuts a check for you. Consider how AirBnB transformed vacation rentals using our houses and Uber transformed mobility using our cars. In the US there are 9 million RVs, and most are stored most of the time. If just 1% of these “recreational vehicles” supported disaster relief in some way, that’s more mobile shelters than FEMA ever deployed, and enough to serve every US disaster in 2017. Our vision is prepared and resilient communities, able to respond to disaster-induced housing loss by placing a mobile army of RVs in temporary locations within 30 days of a disaster. This vision is not based on a huge government helping hand, but rather the tried and true American way: a melting pot of rugged individualism, civic responsibility, and communal effort. In short, this is a barn raising on wheels. Please help! The founder of this project is Arthur Zwern, a serial innovator with extensive experience in Homeland Security. Post 9/11, his start-up Geometrix deployed the best-performing facial recognition solutions ever tested by the US Government to that point. Post Katrina, his disaster sheltering venture HOMErgent won an international “Best Security Idea of 2008” award, as judged by a panel representing US government agencies and global defense contractors. Kimberley Carr provides on-the ground logistics, casework, and documenting issues such as government health and safety guidelines, restoring utilities, and clearing debris, and screening of RVs, donors, and recipients. After months of effort, Kimberley also collaborated with a non-profit to obtain tax write-off privileges on donated RVs. She is the owner of TipsFromSurvivors.org. If you would like to learn more about the RV Guide for Sonoma County, please visit her website. Currently we have a very important collaboration with Mighway.com to facilitate emergency RV housing rentals with insurance at deeply discounted prices. Many others have jumped in to help from RV owners, to programmers and lawyers. We wish to acknowledge our friends of RVsWithoutBorders as our experience with the current fire storm unfolds. And most of all, we hope this initiative stimulates better transitional sheltering solutions in the future.